Custom Crystals Jewelry Handmade for Bridal Bridesmaid Flower Girl Wedding Jewelry. 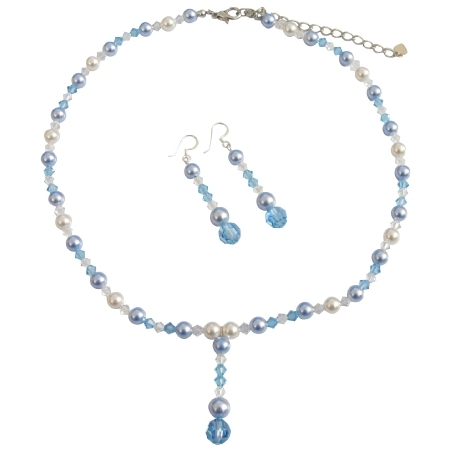 These pretty Swarovski Lite Blue Pearls White Pearls Aquamarine & AB Crystals with cute drop down. Our Wedding Jewelry accessory appropriate for brides members of the bridal party & guests. Handmade Exquisite Necklace All A Grade & Swarovski Crystals Material are used to make this beautiful Necklace & Earrings. Material Used : Swarovski Lite blue Pearls 6mm white Pearls 7mm aquamarine 4mm bicone Crystals 4mm AB Crystals & 8mm aquamarine round bead.